Altec Lansing VS2321 is a 2.1 speakers set for laptop computer or desktop PC. The Altec Lansing speakers set consists of two small satellites and a 5.25-inch subwoofer with maximum power output of 28 Watt (RMS). VS2321 features frequency response of 150 – 20000 Hz (subwoofer at 30 – 150 Hz), THD at 10% and front speaker has a dimensions of 2.9 in. x 3.4 in. x 8.2 in. and subwoofer is 6.4 in. x 7.7 in. x 11.3 in. PC Magazine reviews Altec Lansing VS2321 computer speakers and concludes with editor’s rating of 4 out of 5 that the VS2321 is a very affordable and good-sounding 2.1 speaker system for just about any audio source. It won’t take up a lot of room on your desktop, either. 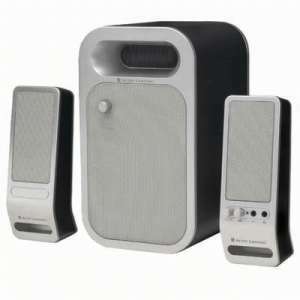 (Altec Lansing also offers the VS2320, which does not include the subwoofer.) I just wish the main speakers didn’t tip over so easily.